As a designer, Angie is always coming up with new and exciting ways to showcase her creative work. Her new children’s book is no exception. 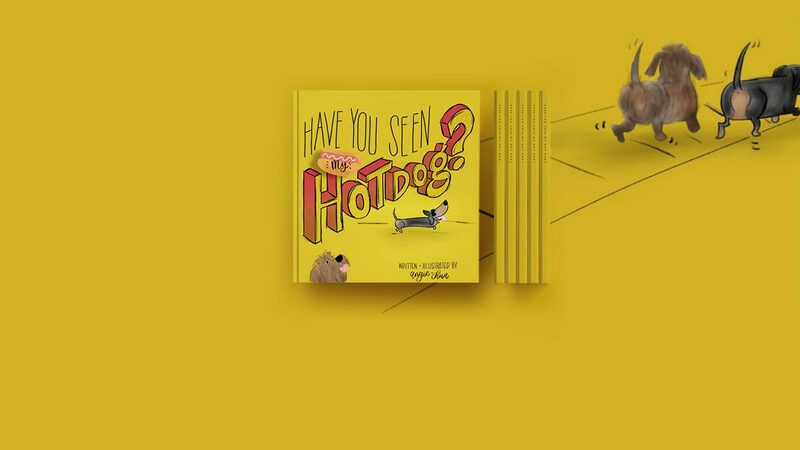 Combining a charming children’s tale of the love between two best friends (who just happen to be dogs) with her lettering and illustration skills, Have You Seen My Hot Dog, is a beautiful portfolio book with a twist. We’re excited she took some time to talk with us about her most recent project. Where did the inspiration for your book come from? It may not be a surprise based on the book, but I have two dachshunds, Harriet and Jager (Jager is named Francis in the book) and they were the inspiration behind it all. When people discover that Jager is blind, I’m always asked, ‘Is Harriet a good seeing eye dog?’ to which I always reply, ‘NO.’ But the unconditional love they have for one another is just so magical to watch, I wanted to find a way to share that with the world. Why did you particularly choose to make a children’s book? What artist or illustrator doesn’t dream of making a children’s book? It’s something I’ve always wanted to do. There’s a whimsical aspect that I love to tap into when it comes to my work, but a children’s book has so many other challenges to it. Having to push through that really interested me. The kicker was knowing that Blurb’s book quality gave me the opportunity to create something that I know will look great in print. How did you decide on things like trim size and paper type? When I heard about Layflat paper, I was really excited. I’ve made photo books in the past, and the portion that gets close to the binding was not always the best real estate. Which tools did you use to create your book? I used my iPad which gave me the flexibility of being able to create on the fly anywhere without having to carry pens and paper. It also meant I didn’t have to worry about digitizing the work. I have it on me at all times, so when the mood strikes and I feel inspired, I can start drawing and jotting things down instantly. What’s also great is that I was able to import all the drawings from my iPad to my desktop and into the Blurb BookWright tool. I also loved the editing tools within BookWright. I was initially going to mock the book up, re-edit the photos for size, and then add text using Adobe Illustrator. BookWright had all that functionality built in, which saved me a lot of time. What plans do you have for your book? Of course I want to share it with my friends who are parents , friends who are crazy wiener dog people, and artist friends looking for ways to showcase their creative work. I’d love to get this book in their hands first and foremost. 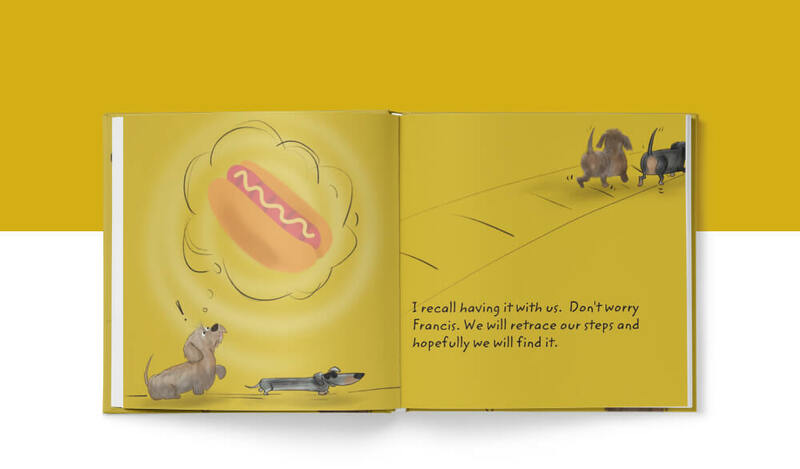 And if things look good, I’d love to promote it with proceeds going to local dachshund rescues across the country. What steps will you take to promote your book and get it out into the world? Fun fact, Harriet has more friends in this world than I do. She has an Instagram account @harriettheween and loves to talk about her favorite things like her luxurious bangs, her favorite foods (corn dogs and wheels of cheese being at the top), and the adventures she has with her ‘blind weena friend’. She will be very excited to share this book with her friends. I also have two followings—one for my lettering @bobolettering and one for the lifestyle brand I founded @bobodesignstudio. We’d also love to bring this book to our local community circles and have Harriet do a reading for kids at a local library or community center. Why is a book a particularly useful branding piece for creative professionals? In a world where Instagram, Dribbble, and Behance rule the world, it’s nice to rewind, go a little analog, and create a physical product that you can hold and feel. I have so many artist/designer friends, and I’d love to share with them how they can elevate their portfolio books, lookbooks, and brands in a meaningful way with these gorgeous and easy-to-make books. As artists, we want to curate our collections and feeds, but with the mass consumption of digital media, it’s hard to cut through the noise, the algorithm changes, and the link sharing overload. Making a book is the perfect way to regain control, and do what it is that we love to do—create beautiful things. Bobo design studio offers so many beautiful products! Where do you find your inspiration for your day-to-day work? Well first off, THANK YOU! I am and always have been a compulsive maker/artist. If you could look inside my head, it would look exactly like Ariel’s treasure den in The Little Mermaid. It’s a collection of random things that on the surface are entirely meaningless and devoid of value—borderline hoarder-ish. But each of those things is unique to Ariel, and sparks her imagination. ‘Dinglehopper.’ Need I say more? I’m the same way. My mind never rests. I regularly see random things and subconsciously store these gems in my head. It’s not until weeks later that I realize ‘the thing’ I’ve subconsciously tucked away is part of a bigger ‘thing’. So much of my work is just physical representations of the connections between random ideas that mush together inside the hoarder’s nest in my brain! How did making a book compare to your other creative work? Creating a book was a challenge for me. A lot of the lettering work, photography, and even textile-based work that I do is centred around a single piece. One drawing. One bag. One photo. There is instant gratification in making that one thing, and then being done. Things happen organically, and there is less planning involved. With this book, I had to shift back and forth between creating and planning. On top of that, to keep the consistency of the characters from page to page was something I’m not used to doing. It was so much fun to push myself, and I’m so happy with the final product! Any plans for more books in the future? After seeing how ridiculously easy it was, absolutely! I have a growing collection of hand-lettered pieces over my original photography from all the places I’ve visited. I’d love to make that into a book, a giant ‘passport’ so to speak and possibly sell it to various National Parks and State Park Visitor Centers. We can’t wait to see what Angie does next. 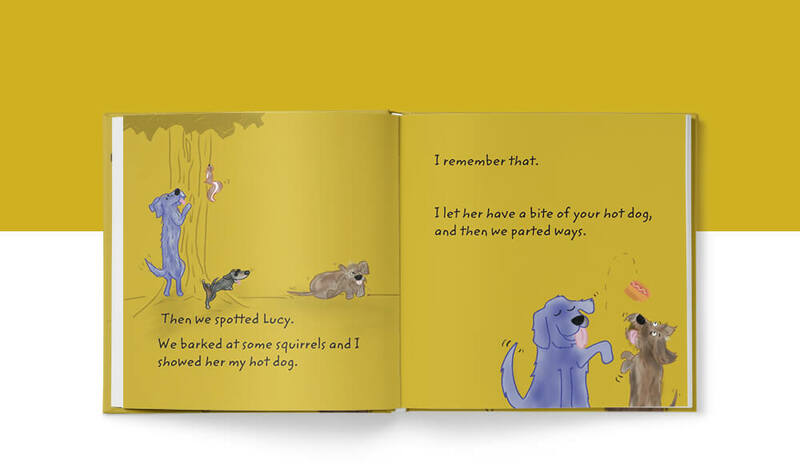 In the meantime grab your copy of Have You Seen My Hot Dog in the Blurb Bookstore or make your own book. Thank you! I am so thrilled to have made this book and to be featured. I loved the process and the design tools. I still can’t get over how easy this was!